This morning, our group was to meet a little later at 8 am for breakfast, so in theory, we could sleep in a bit. Well the choir of roosters had another idea! This morning, Corinne, a pescatarian vowed she was eating chicken soup tonight for dinner…only if it was made from the roosters! The early morning for me meant that I had access to wifi enough to post a couple of pictures. 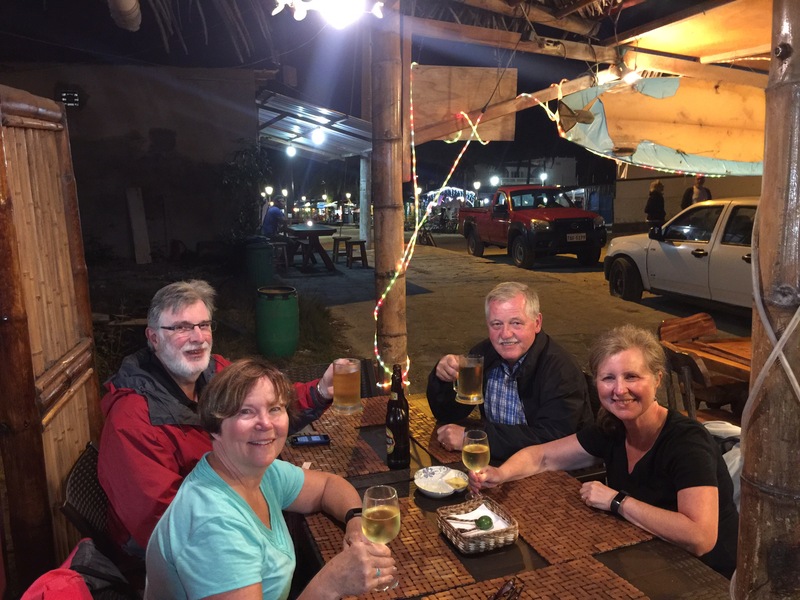 I’m hoping I’ll be able to keep up each day while we are here…there is just so much to tell you all that it would be hard to post all the pictures at the end of this trip. After breakfast we boarded a bus for a bit of a walking tour back into town. But first, a necessary stop at the laundry to drop off our first load of clothes for washing! Yes even in these small communities there are places that cater to those who are away from home. 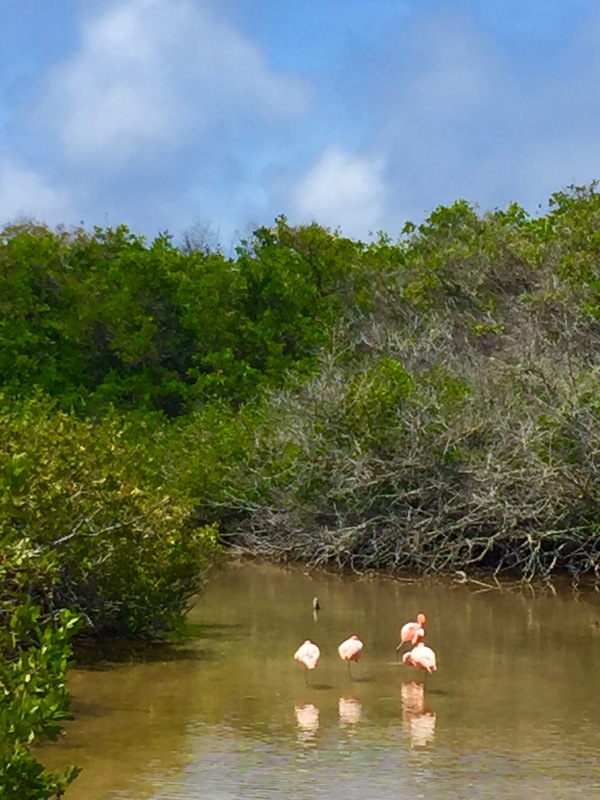 Our first “official” stop was a lagoon where we saw some pink flamingos feeding. This lagoon started out as a quarry, but when they found the flamingos feeding, they stopped all future excavation. Now it’s a small protected pond with a bounty of bird life feasting on the food within. 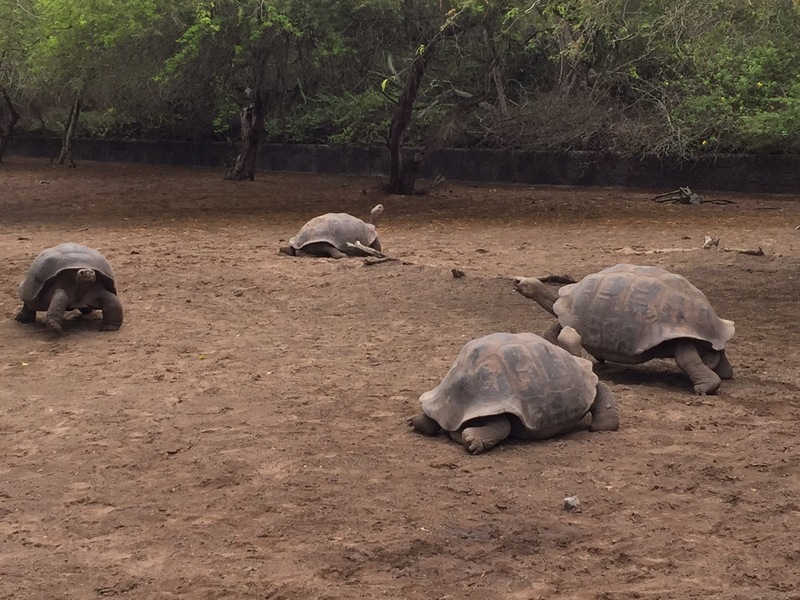 Our next stop was the land tortoise breeding sanctuary, where we saw both the dome back and the flat back tortoises. These animal were poached to a point of near a distinction, first the buccaneers would take them on board because they could live up to a year without food or water, and thus made a ready supply of fresh meat for long voyages; and second the Spanish mainlanders captured them to use their high fat content for oil lamps. It was estimated that there was a population of around 250,000 prior to this poaching. Now with this breeding and protection program there is about 25,000 in the wild. Today, the young are still threatened with introduced species such as dogs, rats and cattle which either eat the eggs/newborns or stomp on the nests crushing the eggs. Without this breeding and release at 6-7 years of age there would not be any tortoises left on these islands. After the breeding centre, we walked along a path that went from a arid forest of poison apple trees through to a mangrove wetland. 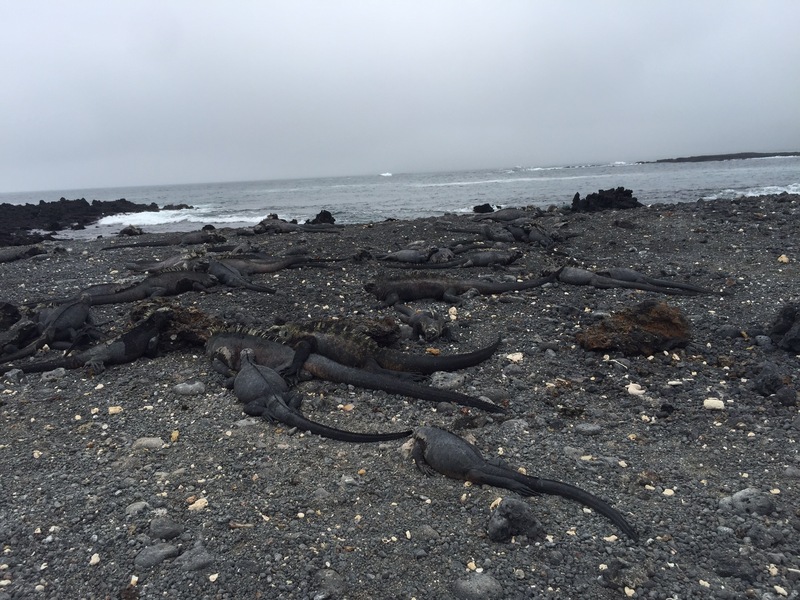 Again we saw pink flamingos, endemic pin tailed ducks and lots of marine iguana. Our walk ended up on the beach of the small town where we are staying. Absolutely enchanting! We hope to get back down to the beach this evening for the sunset! After our walk we all went to a small restaurant for lunch, and then back to the room to get ready for our last “official day” of snorkelling. We grabbed our gear and headed down to wharf to pick up a boat that would take us to our snorkelling destination. Another great day for adventure adding sea iguanas and star fish to our playmates along side many sea turtles and sea lions. Just a delight! 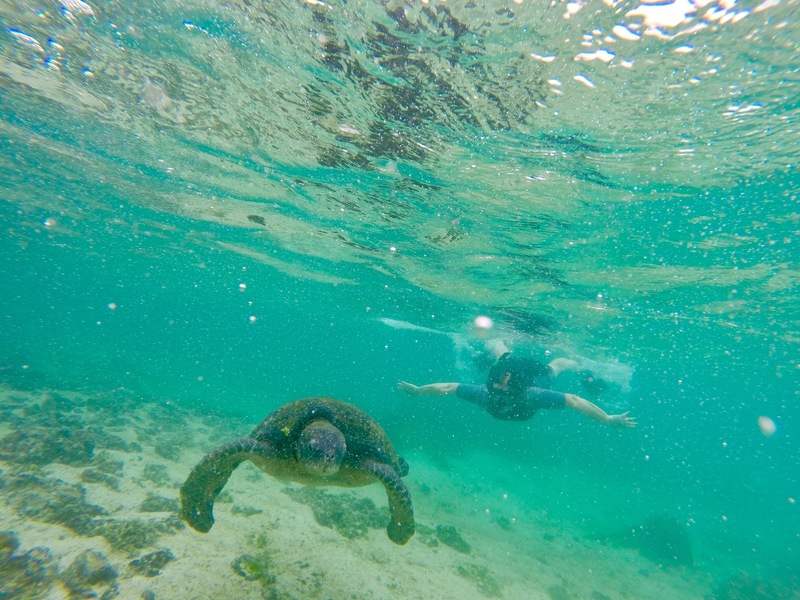 Here’s a shot of Dan and I swimming with a Sea Tortoise. After our swim, we went off to the Las Tintoreras which is a hand full of jagged black lava grottos poking out of the sea. 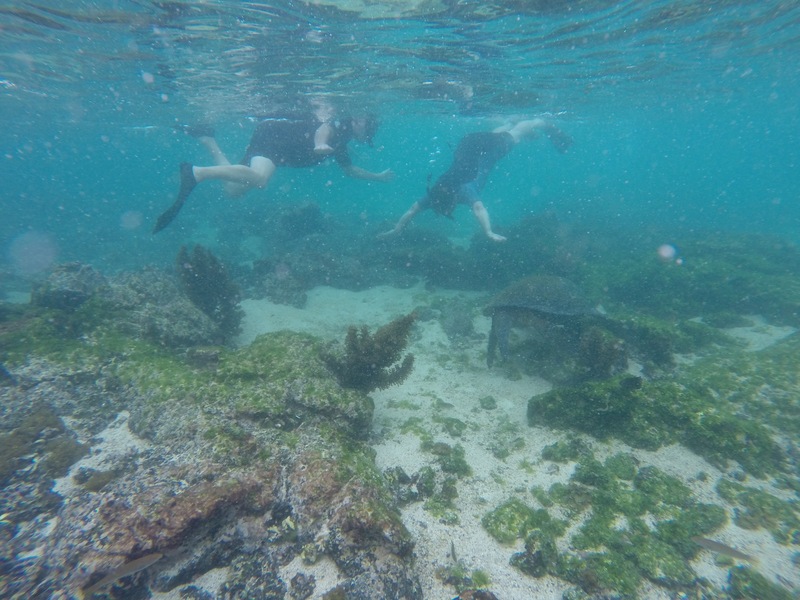 Here we saw countless sea iguanas, both adults and juveniles. 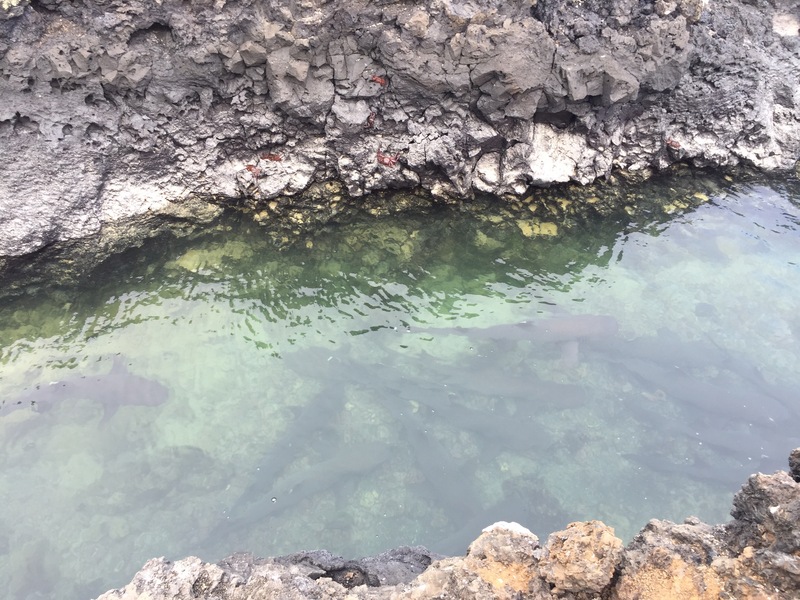 We came across a very narrow channel and saw a “viewing gallery” of white tipped reef sharks lazily floating on the bottom. Apparently they are one of the few sharks that do not have to keep moving when they sleep, they simply lie pretty much on the bottom of the channel and the water running by their gills keeps them alive. Only today they had a playful sea lion that kept teasing them and wouldn’t let them sleep! No signs of violence though!! Once back at the hotel we got ready to go out for dinner. Glen and Gwen and Dan and I headed out to a restaurant recommended by our guide, Winston. The food was wonderful at Coco Surf, so glad we went! We took a leisurely walk back to our hotel and indulged in a couple of rounds of euchre before calling it a night. Tomorrow will be another long day with a 16 km hike to see the largest volcano caldera in the Galapagos, and one of the largest in the world! Well I’d better sign off for now! Will try to beat the wifi crowds again tomorrow morning so that I can post a few photos of the day for you! Hasta mañana! The wine. Is that breakfast or dinner? You guys are so adventuress.Wonderful.